First let’s talk about electricity prices. If you do nothing to change the electricity situation on your property in Sacramento, do you predict your expenses will decrease over the next few years, or even decades? Naturally, you expect to pay considerably more for your electricity ten to twenty years from now. So when you invest in photovoltaic panels today, you begin saving money on your energy expenses the moment you turn on the power of the sun! Everyone knows that installing photovoltaic panels minimizes your electricity costs. It is the upfront investment that scares most property owners in Sacramento away from immediately seeing their energy expenses decline, in some cases even down to zero. We will talk about costs in a moment, but now let’s consider the environmental benefits. The Environmental Protection Agency figures that the average household in America uses almost 15,000 pounds of carbon annually only to provide electricity for their home. This shows that if you install photovoltaic panels, in twenty years you will go from burning 300,000 pounds of carbon into the atmosphere to releasing a miniscule fraction of that amount. 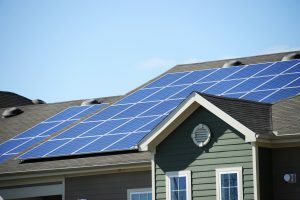 So if you want your property to help change the balance on global warming, photovoltaic electricity is a leading place to begin. How else can Solaron make photovoltaic less expensive? By utilizing ongoing incentive programs offered by governments and municipalities! As these vary based on your specific locale and electricity provider, consult with a Solaron sales agent today to hear about these potentially huge savings!